Otoh, people who enjoy playing with their builds, say convert towers to attk now that larger lands exist, or correct that accidental def attk bldg, lol... They're gonna be the real happy ones; a 'free' conversion plus some pocket change. Whoohoo. 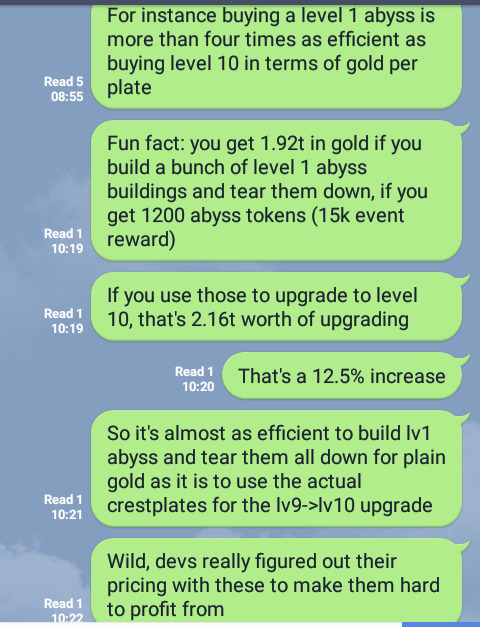 Yeah, I've been enjoying getting a bonus 1b/hf token to put towards abyss/or land personally. A lot of clanmates have been getting the nice drop price and rearranging, but at my size and build I'm quite happy just for useful gold. Protip: you can go up to a lv6 building on hf and then drop it for just a hair under 1b/token. It's a lot faster than lv1s, for sure, and gets you just about the same result. Updated again! Thanks again spivey! Thanks chub! Updated. Interesting that 18->19 and 19->20 are the same, the other lands the gold/token consistently declines. Happy to help  if anyone has info to fill in the last few empty slots, let me know!